Spring is coming and you may notice your dog is starting to shed more, getting rid of the extra winter coat. Blowing a coat can last from a couple of week to over a month and your house can become crazy. If you’re looking for ways to help control the shedding and keep your place somewhat clean, try these tips. 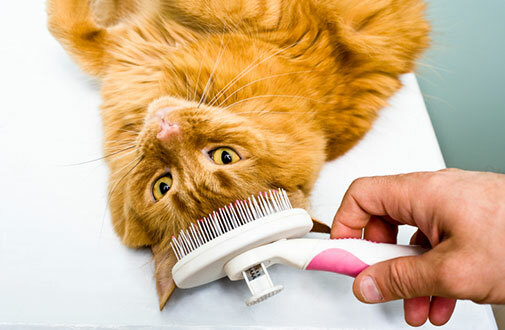 A warm bath – A nice warm bath will loosen the dead hair and if you can brush your dog with a glove brush while in the tub, it’ll pull all that dead fur off. Follow up with a high quality pet conditioner and thoroughly dry your dog afterwards. If your dog tolerates a blow dryer, use a low heat. You can bathe your dog twice a month during shedding season. Look for a self-wash dog grooming place so your tub at home and bathroom doesn’t look like a stuffed animal exploded. Brushing – Brush your dog more often during shedding season. If you can, spend a few minutes everyday brushing your dog’s fur, especially around the neck and sides. Catching the fur before it sticks to your couch, your pants, and everything else will remove the loose fur and keep you sane when vacuuming. Vacuum your dog – Yea, you can try it. If you have a dog that won’t freak out at the sound of the motor of the vacuum, use one of the upholstery attachments or you can pick up a “dog” attachment and run it over your dog’s body. Some dogs love the feeling. If this is your first shot, go slow and make sure to accustom your dog to it gradually so they don’t freak. Call the groomer – A good bath, haircut, nail trim, and brush out by a professional can remove a lot of loose fur. Your groomer has the right brushes and tools to get that excess fur off your dog. Finally, don’t worry, shedding season doesn’t last forever, it just drives us crazy for a little bit.